Click to Listen, pt 1 – Pt 2 available here. Well now, would seem that RevKess has been even more neglectful of things than usual. It has been some time since he did an edition of Musica Pagani. He’s making it up for it the best he can with a two parter: Rock It, Pagan Style! Earlier in 2013, Kenny Klein launched a recording project with his touring band FishBird. Some of the music they did was rock-like covers of some of his older music. And of course, every good musician is experimenting with new pieces whenever possible. That’s just what FishBird has done. 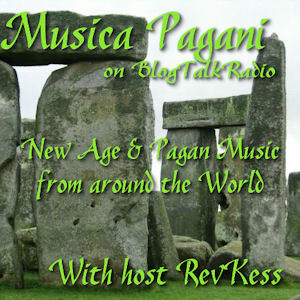 In this two parter of Musica Pagani you will get a taste of FishBird as well as some other rocking musicians and bands with a distinctive Pagan flare. Everyone from Leigh Anne Hussey with her unreleased Uglytown demo to Wendy Rule and Rosin Coven, with stops along the way to visit with Omnia and Frenchy and the Punk. We do hope that you have enjoyed this special edition of Musica Pagani!